This past Saturday, Ocean Grown Pong played host to the 11th WSOBP XI Satellite Tournament thus far, which qualifies players to participate in the annual World Series of Beer Pong tournament, presented by BPONG.COM. There are currently 12 more Satellite Tournaments scheduled across the globe that have yet to be dictated; October being hot, as 9 of those 12 events will be played during this month. Though many more Satellite Tournaments will sprout up between now and July of 2016, we can officially consider ourselves coming into the heart of Satellite Season. Typical WSOBP XI Satellite Tournament entry fees per player usually hover between $20 and $30 per bracket. Most tournaments run with a BPONG affiliation have converted over to a “double-bracket” format. Double-bracket tournaments consist of what are essentially two entirely different tournaments that typically require 2 losses before elimination. Once each bracket is played through in its entirety, the winners of each bracket meet in a Championship Series that dictates who takes home the prizes! The Hideaway Café in Riverside, CA, had a FULL house on September 26th, 2016 that saw a couple familiar faces take home their first bid win of the season. Coming out of the first WSOBP XI Satellite Tournament bracket was Mark Pimentel, who you may recognize from some of our recent blog articles. Mark has been an absolute monster recently (as if he hasn’t always been) and has taken home some big time wins. His partner in the first bracket was none other than Ocean Grown Pong’s very own, Ryan De Hoop. Many may not realize just how difficult it is to run an event and keep your hand hot enough to shoot your way to a win. The second bracket was of “random” variety, meaning that partners were selected completely randomly. The reason for implementing a “random” format into one of the brackets is to keep the best players in the game from consistently forming teams together. The “random” factor generally helps spread out the talent and introduce new players to the veterans of the game. However, the random format is not flawless and sometimes great players end up with an even better random draw. Mark Pimentel found himself with an early victory as he and his random partner, Zak Corsi fought their way through the second bracket. Tricky situation, I know. Here’s how it works. Mark won both brackets with two different partners, which means, Mark already won the tournament and gets to sit out while he watches his two partners play a best-of-3 singles series to see who gets the other bid. Corsi took game 1 of the best-of-3 series and put De Hoop against the wall right out of the gate. However, De Hoop battled back to take the next two straight games and secure his World Series of Beer Pong XI Satellite Tournament Championship! Mark Pimentel and Ryan De Hoop will both receive a qualified entry into The WSOBP XI Main Event and a 4-night complimentary stay at the Westgate Las Vegas Resort & Casino from July 6th – 10th, 2016. Mark also finished 1st and 2nd in the two side events that were hosted at Hideaway; One being a singles event, of which he finished second behind Lake Forest, CA, Ponger, Ryan Smith; The other side event being a Co-ed tournament, where Mark and his first lady, San Diego Ponger, Jessi Links, brought home the win. 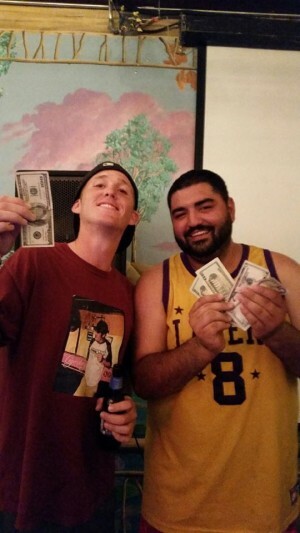 Ocean Grown Pong’s WSOBP XI Satellite Tournament Singles Event Winners: Ryan Smith (1st) & Mark Pimentel (2nd). You can catch Ocean Grown Pong and yet another WSOBP XI Satellite Tournament at the very same spot, The Hideaway Café in Riverside, CA, on October 24th, 2015. Whether you just missed the win on the 26th or just want to stop by to check out the action for the first time, it’s sure to be a great tournament! Can’t make October 24th? No problem, OGP has you covered as they have a Satellite Tournament scheduled for November 5th, 2015 at Johnny V’s in San Diego, California. This particular Satellite event will precede the West Coast’s biggest event of the year, The 5th Annual West Coast Championships (WCC)! The WCC event is co-hosted by Ocean Grown Pong, as well as, our friends over at Nor Cal Beer Pong and Pongstars.net! For all other information on The World Series of Beer Pong XI Satellite Tournaments taking place around the globe, you can visit bpong.com to find out where all the action is going down, as more events are continuously added! Whether you are near Michigan, Texas, California, Minnesota or even Switzerland, we got you covered for your opportunity to win your way in and compete in the end all, be all, of beer pong tournaments, THE WORLD SERIES OF BEER PONG! Didn’t find what you are looking for? Drop us a line at [email protected] about anything beer pong related!